Posted March 3, 2017 in Book Reviews. I met John on Saganaga Lake in the early 1980’s. He was a Conservation Officer who worked along the border – the invisible line – between Minnesota and Ontario. 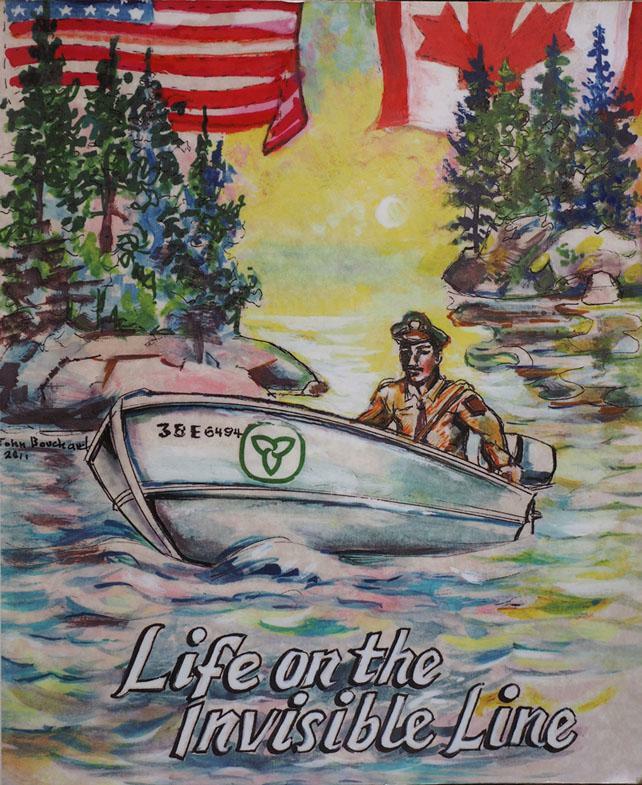 When visiting John and Eve I noticed the mural depicting life on Saganaga in the entryway to his office/home on the lake. John was also known for the wonderful cartoon-like drawings that he did of friends and that also graced his log book that he kept for his job as a C.O. Although I was aware of his abilities as an artist, I only became aware of his wonderful ability to write stories depicting his adventures when I read this book. John was known for his outgoing nature and sense of humour and these traits come through strongly in his book. There have been many books written about the Boundary Waters , Quetico Park and the surrounding area but John’s book is unique. The short stories – based on actual events in John’s life as a Conservation Officer – have over 100 of John’s illustration. They add another dimension to the funny, poignant and often bizarre stories. As John says in his ode to Saganaga on the back of his book, his tales are ” stories told truthfully though colours are bold”. 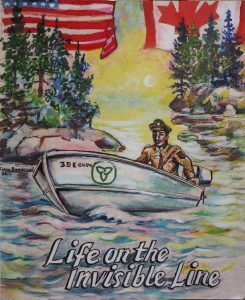 I highly recommend this bold book about the colourful characters that John encountered in his decades along the Ontario-Minnesota border.